This article is about the town in Surrey, England. For other uses, see Guildford (disambiguation). Guildford (/ˈɡɪlfərd/ ( listen)) is a large town in Surrey, England, 27 miles (43 km) southwest of London on the A3 trunk road midway between the capital and Portsmouth. The town has a population of about 80,000 and is the seat of the wider Borough of Guildford which had an estimated 146,100 inhabitants in 2015. Guildford has Saxon roots  and historians attribute its location to the existence of a gap in the North Downs where the River Wey was forded by the Harrow Way. [n 1] By AD 978 it was home to an early English Royal Mint. With the building of the Wey Navigation and the Basingstoke Canal, Guildford was connected to a network of waterways that aided its prosperity. In the 20th century, the University of Surrey and Guildford Cathedral, an Anglican cathedral, were added. Due to recent development running north from Guildford, and linking to the Woking area, Guildford now officially forms the southwestern tip of the Greater London Built-up Area, as defined by the Office for National Statistics. The root of the first part may be the word 'gold' rather than Guild, a society or meeting of tradesmen: the only known 10th-century (Saxon) record uses Guldeford and in the 11th century Geldeford[n 2]; both meaning gold and ford. Local historians with an interest in toponyms cite the lack of gold in the region's sedimentary rocks and have suggested that the mention of 'gold' may refer to golden flowers found by the ford itself, or the golden sand; several older sources such as Lewis's topological dictionary of 1848 prefer and give an unreferenced assertion there was a guild. Rural Celtic Bronze Age pieces have been found in the town. Some of the tiles built into Guildford Castle may be Roman, and a Roman villa has been found on Broad Street Common at the end of Roman Farm Road just west of Guildford's Park Barn neighbourhood. It is proven by archaeology and contemporary accounts that Guildford was established as a small town by Saxon settlers shortly after Roman authority had been removed from Britain[n 3]. The settlement was most likely expanded because of the Harrow Way (an ancient trackway connecting the ancient cities of Winchester and Canterbury) crosses the River Wey by a ford at this point. Alfred the Great referred to the town in his will. Guildford was the location of the Royal Mint from 978 until part-way through the reign of William the Conqueror. Guildford Castle is of Norman design, although there are no documents about its earliest years. Its situation overlooks the pass through the hills taken by the Pilgrims' Way, and also once overlooked the ancient ford across the Wey, thus giving a key point of military control of this long distance way across the country. [n 4]. Guildford appears in Domesday Book of 1086 as Geldeford and Gildeford, a holding of William the Conqueror. The King officially held the 75 hagae (houses enclosed in fences or closes) in which lived 175 homagers (heads of household) and the town rendered £32. Stoke, a suburb within today's Guildford, appears in the Book as Stoch and was also held by William. Its Domesday assets were: 1 church, 2 mills worth 5s, 16 ploughlands with two Lord's plough teams and 20 mens plough teams, 16 acres (65,000 m2) of meadow, and woodland worth 40 hogs. Stoke was listed as being in the King's park, with a rendering of £15. William the Conqueror had the castle built in the classic Norman style; the castle keep still stands. A major purpose of Norman castle building was to overawe the conquered population. It had £26 spent on it in 1173 under the regency of the young Henry II. As the threat of invasion and insurrection declined, the castle's status was demoted to that of a royal hunting lodge: Guildford was, at that time, at the edge of Windsor Great Park. It was visited on several occasions by King John, Eleanor of Aquitaine and King Henry III. In 1611 the castle was granted to Francis Carter whose grandson's initials EC and the year 1699 were above the entrance way. The surviving parts of the castle were restored in Victorian times and again in 2004; the rest of the grounds became a public garden. In 1995, a chamber was discovered in the High Street, which is considered to be the remains of the 12th-century Guildford Synagogue. While this remains a matter of contention, it is likely to be the oldest remaining synagogue in Western Europe. Guildford elected two members of the Unreformed House of Commons. From the 14th century to the 18th century the borough corporation prospered with the wool trade. In the 14th century the Guildhall was constructed and still stands today as a noticeable landmark of Guildford. The north end was extended in 1589 and the Council Chamber was added in 1683. In 1683 a projecting clock was made for the front of the building: it can be seen throughout the High Street. The town's Royal Grammar School was built in 1509 and became Royal gaining the patronage of Edward VI in 1552. In the years around 1550, a pupil at the school was John Derrick who in later life became a Queen's Coroner for the county of Surrey. In 1597 (old style, 1598 by modern reckoning), Derrick made a legal deposition that contains the earliest definite reference to cricket being played anywhere in the world. 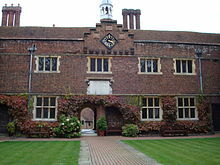 In 1619 George Abbot founded the Hospital of the Holy Trinity, now commonly known as Abbot's Hospital, one of the finest sets of almshouses in the country. It is sited at the top end of the High Street, opposite Holy Trinity church. The brick-built, three-storey entrance tower faces the church; a grand stone archway leads into the courtyard. On each corner of the tower there is an octagonal turret rising an extra floor, with lead ogee domes. One of the greatest boosts to Guildford's prosperity came in 1653 with the completion, after many wrangles, of the Wey Navigation. This allowed Guildford businesses to access the Thames at Weybridge by boat, and predated the major canal building program in Britain by more than a century. In 1764 the navigation was extended as far as Godalming and in 1816 to the sea near Arundel via the Wey and Arun Junction Canal and the Arun Navigation. The Basingstoke Canal also was built to connect with the Wey navigation, putting Guildford in the centre of a network of waterways. The Chilworth gunpowder works operated right through the Industrial Revolution, and transported much of its wares through Guildford and its toll paid[clarification needed] canal network. A six-mile (10 km) branch of the London and South-Western Railway from Woking to Guildford was opened in May 1845. In 1846, Acts were passed for making two railways from Guildford: one leading to Godalming, and the other to Farnham and Alton; and in the same year, an Act was obtained for a railway from Reading, via Guildford, to Dorking and Reigate. All of these followed in the 19th century and remain in use. From 1820 to 1865 Guildford was the scene of severe outbursts of semi-organised lawlessness commonly known as the "Guy Riots". The Guys would mass on the edge of the town from daybreak on Guy Fawkes Night, wearing masks or bizarre disguises and armed with clubs and lighted torches. At nightfall they would enter the town and avenge themselves on those who had crossed them in the preceding year by committing assaults and damaging property, often looting the belongings of victims from their houses and burning them on bonfires in the middle of the street. In later years attempts to suppress the Guys led to the deaths of two police officers. In 1866 and 1868 the Guys were dispersed by cavalry and this seems to have brought an end to the riots. Similar disorder surrounding the St Catherine's Hill Fair, held just outside the town on the Pilgrims' Way, was suppressed around the same time. In 1906 the Guildford Union Workhouse Casuals Ward ("The Spike") was built on the grounds of the Workhouse near the castle; today The Spike is a tourist attraction. After the death of their father in 1882, brothers Charles Arthur and Leonard Gates took over the running of his shop, which held the local distribution franchise for Gilbey's wines and spirits, and also sold beer. However, in 1885, the brothers were persuaded to join the temperance movement, and they poured their entire stock into the gutters of the High Street. Left with no livelihood, they converted their now empty shop into a dairy. Using a milk separator, they bought milk from local farmers, and after extracting the cream and whey, sold the skim back to the farmers for pig feed. In 1888 three more of the Gates brothers and their sons joined the business, which led to the formal registration of the company under the name of the West Surrey Central Dairy Company, which after development of its dried milk baby formula in 1906 became Cow & Gate. In 1901, the Dennis brothers built the first purpose-built car factory in England. It was subsequently known as the Rodboro Buildings after being taken over by the eponymous shoe company in 1919. During World War II, the Borough Council built 18 communal air raid shelters. One of these shelters, known as the Foxenden Quarry deep shelter, was built into the side of a disused chalk quarry. Taking a year to build, it comprised two main tunnels with interconnecting tunnels for the sleeping bunks. It could accommodate 1000 people and provided sanitation and first aid facilities. Having been sealed since decommissioning in 1944, it has survived fairly intact. The quarry itself is now the site of the York Road car park, but the shelter is preserved and was occasionally open to the public though visits are now suspended. In May 1968 students at Guildford School of Art began a "sit-in" at the School in Stoke Park which lasted until mid-summer. On 5 October 1974, bombs planted by the Provisional Irish Republican Army went off in two Guildford pubs, killing four off-duty soldiers and a civilian. The pubs were targeted because soldiers from the barracks at Pirbright were known to frequent them. The subsequently arrested suspects, who became known as the Guildford Four, were convicted and sentenced to long prison sentences in October 1975. They claimed to have been tortured by the police and denied involvement in the bombing. In 1989 after a long legal battle, their convictions were overturned and they were released. In the 21st century Guildford still has a High Street paved with granite setts often referred to as cobbles, and is one of the most expensive places to buy property in the UK outside London. The town has a general street market held on Fridays and Saturdays. A farmers' market is usually held on the first Tuesday of each month. There is a Tourist Information Office, guided walks and various hotels including the historic Angel Hotel which long served as a coaching stop on the main London to Portsmouth stagecoach route. Guildford was voted the 9th best place to live in Britain in 2006 but slipped to 12th position in 2007, "largely due to the pollution produced by the numerous cars found on the roads". Guildford is the most attractive and safe shopping destination in the UK, according to the Eve Prime Retail Survey 2004 and ranked 27th in the country overall. Except in winter, The National Trust run short and longer trips on the Wey Navigation, starting from Dapdune Wharf in the town centre, where there is a visitor centre. An arched Gothic restored medieval storage Undercroft in the High Street is open twice a week. Receiving many grants and local support, the relatively small Guildford Castle has a roof viewing platform, 2003–4 added floor, a model of the fullest original castle[n 5] and interpretation panels. Guildford has an Olympic-size Lido May-to-September, dating from the 1930s, that is open for public swimming or hired corporate entertainment. Guildford is sometimes described as the county town of Surrey, but it is not clear whether this is the case or not. The issue is not made easier because sources disagree over the definition of a county town. Most sources state that the county town is the administrative centre for the county, but local government undergoes frequent reorganisation and what was once the county town may no longer be the administrative centre. Surrey County Council has no administrative presence in Guildford but is in central Kingston upon Thames, which became part of Greater London in the 1960s, though the above cite claims Guildford as the county town. There appears to be no requirement that a county town actually has to be within the borders of the county, and the Oxford English Dictionary defines 'county town' as, "The town that is the administrative capital of a county", a description which would disqualify Guildford. There are claims that Henry VII granted the status of county town when he made Guildford the custody of the standard measures. However, the statute does not explicitly state that this makes the settlement a county town. Guildford's previous official historian[who?] claims that Guildford was granted the "ancient county court in Guildford by a grant of Henry III in 1257, marking Guildford's status as county town of Surrey", but it has been argued that this status is an inaccurate interperatation by said historian. His position is not backed up by the original documentation. Whilst there are sources that claim Guildford as the county town there are many others such as Whitaker's almanack that assign this definition to Kingston upon Thames, with others stating that it is not clear. Neither Guildford Borough Council nor Kingston Council make any claim for their town being the county town. Like the rest of Surrey and the large majority of the British Isles, Guildford has a maritime climate with cool summers and mild winters. The nearest Met Office weather station for which records are available is at Wisley, about 6.5 miles (10 km) to the north-east of Guildford. Extremes of temperature recorded in the area range from 37.8 °C (100.0 °F) during August 2003 down to −15.1 °C (4.8 °F) during January 1982. The Wisley weather station held the UK July record high of 36.5 °C (97.7 °F)(2006) between 2006 and 2015. The lowest temperature reported in recent years was −12.6 °C (9.3 °F) during December 2010. Guildford has an art gallery, Guildford House Gallery, in the High Street, in a 17th-century Grade I listed town house which is run by Guildford Borough Council. Its art collection includes works of Guildford and the surrounding area, and works by Guildford artists, most notably John Russell. Also run by the Borough Council is Guildford Museum housing archaeology, local history and needlework displays. Smaller private fine art galleries are also present on the High Street. The town's principal commercial theatre is the Yvonne Arnaud Theatre, which often shows productions after they have spent time in London's West End. The Electric Theatre opened in 1997 to host performances by musicians and amateur drama groups. It also hosts regular film, family and music festivals as well as comedy, and has a Riverside Cafe Bar and Terrace. Guildford has an Odeon cinema multiplex, which in June 2007 was the first cinema in the world to show digital 4K films to the public. Guildford Civic Hall was the town's main arts and entertainment venue until it closed in January 2004. The Civic Hall was replaced by a new venue, G Live, which opened in September 2011. In 2009 the Mill Studio in Guildford featured the English premiere of the one-woman musical, Estelle Bright, starring actress/singer Sarah Tullamore. Guildford Shakespeare Company performs in the town, using the bandstand in the castle grounds as the stage in the summer and several churches close to the High Street through the winter. The Guildford Philharmonic Orchestra, founded as the Guildford Municipal Orchestra, received full council funding from 1945 until it was withdrawn in 2012. The orchestra was disbanded in March 2013, with Guildford Borough Council providing a classical music grant to other organisations instead. Stoke Park, Guildford's largest park, was the venue for the now-defunct GuilFest music festival during the summer but still hosts the Surrey County Show – agricultural and general – on the last bank holiday Monday in May. Prior to 2007, the Ambient Picnic was held in Shalford Park, by the River Wey. Guildford has a model railway club, the Astolat Model Railway Circle, which meets at the National Trust's Dapdune Wharf. They host an annual model railway exhibition at the Sports Park in January. Radio stations Kane 103.7 FM, 96.4 The Eagle, County Sound Radio (1566 AM), GU2 Radio, and BBC Surrey are based in Guildford. The Church of England Diocese of Guildford was created in 1927, and Guildford Cathedral was consecrated in 1961. Previously, Guildford had been part of the diocese of Winchester; Guildford has eight ecclesiastical parishes – the Grade I listed church buildings are Holy Trinity (in the High Street); St Mary's (on the East Bank) and the medieval II* Listed Anglican churches of St John the Evangelist (in Stoke) and St Nicolas (at the foot of Guildown (the west bank). One breakaway church tied to St Martha's Church on rural St Martha's Hill forms a freestanding church, Christ Church, Guildford. There are three Roman Catholic churches, to St Joseph, St Marys in Rydes Hill, and St Pius X in Merrow. St Augustine's Abbey at Chilworth on the outskirts of Guildford is a Grade II listed building designed by Frederick Walters and constructed in 1892. It is one of four Benedictine monasteries in Great Britain having been a Franciscan Friary of the Order of Friars Minor until 2011. Guildford has had a synagogue as early as the 12th century. The modern-day synagogue was consecrated by Chief Rabbi Immanuel Jakobovits in 1979. Guildford's Spectrum Leisure Centre is a national prize-winning sports centre that includes a variety of pools (for leisure and for serious swimming), ten-pin bowling, a laser tag area, an ice rink and an athletics track, as well as general halls used for indoor sports including gymnastics and trampolining. The Spectrum is home to several local sports teams, including Guildford City Football Club of the Combined Counties Football League, and the Guildford Flames of the British Elite Ice Hockey League. Guildford International Volleyball Club have managed to win the top of the fourth division of the National Volleyball League. The Surrey Sports Park, owned by the University of Surrey, opened its doors to the general public on 19 April 2010 and is part of the university's Manor Park campus close to the Royal Surrey County Hospital and the Surrey Research Park. It has a 50-metre swimming pool, and a climbing wall, as well as squash courts, and floodlit tennis and artificial pitches. It is now the home of Surrey Scorchers of the British Basketball League and the Surrey Sharks of the Rugby League Conference London & South division. Guildford Cricket Club play their home matches at the Woodbridge Road ground. Surrey County Cricket Club also play one or two matches a season there. Guildford Hockey Club is based at Broadwater School in Godalming, and the men's 1XI compete in the England Hockey League. Surrey Spartans Hockey Club is based in Guildford at the University of Surrey Sports Park. Charlotteville Cycling Club is based in Guildford and named after one of the areas of the town. They promote the Guildford Town Centre Cycle Races that take place on the cobbled high street each July. Guildford has two indoor rock climbing centres, Craggy Island on Moorfield Road in the Slyfield Industrial Estate, and a climbing wall at the Surrey Sports Park. Guildford City Boxing Club, (formerly Guildford City ABC), headed by GB coach, John Edwards is based in Cabell Road in the town. Founded in the 1920s and originally called the Onslow Lions, the boxing club is considered one of the oldest in Surrey. Guildford Crows Aussie Rules FC were founded in 2009 and compete in the AFLGB Southern Division. They train at Stoke Park and play home matches at Effingham and Leatherhead Rugby Club. Guildford Rowing Club is based in the town and has won at Henley Women's Regatta. As in the rest of Surrey, Guildford's state schools operate a two/three age groups system. Primary schools in the town include Holy Trinity (which merged with Pewley Down in 1995), Burpham, St Thomas of Canterbury (Catholic), Boxgrove Primary School and Guildford Grove. Amongst the junior schools are Bushy Hill, Northmead Junior and Queen Eleanor's C of E. Secondary schools include George Abbot, Guildford County School, St Peter's, King's College and Christ's College. The best-known school in Guildford itself is the Royal Grammar School. The 'old school' building, which was constructed over the turn of the Tudor and Elizabethan periods and houses a chained library, lies towards the top of High Street. The school was established in 1509. Nearby is the prep school Lanesborough School which is the choir school for Guildford Cathedral and has had a long association with the Royal Grammar School. Other independent schools include Guildford High School, Tormead School, Priors Field School and Rydes Hill Preparatory School. The campus of the University of Surrey is in Guildford. Battersea College of Technology (previously the Battersea Polytechnic Institute) moved to the town in 1966, gaining a Royal Charter in order to award its own degrees and changing its name to its current title. The town is home to the inaugural campus of the University of Law and to the Guildford School of Acting. Other institutions in Guildford include Guildford College of Further and Higher Education (which also occupies the site of the former Guildford School of Art), Academy of Contemporary Music and the Italia Conti Arts Centre. The town of Guildford forms part of the larger area administered by the borough of Guildford, which in turn forms part of the county of Surrey. Whilst the rest of the borough's area is split into civil parishes, the urban area of Guildford in unparished. Thus, within the town of Guildford, the Borough Council takes the role of both first and second tier local authority, whilst the County Council forms the third tier of local authority. Though often referred to as a city, Guildford is a town, but has applied for city status several times. Guildford's 2002 application to be granted the status of a city was unsuccessful, losing out to Preston, the only English town that was formally recognised as a city as part of the Queen's Golden Jubilee celebrations. Traditionally, the establishment of a diocesan cathedral in a town conferred city status. Guildford is a significant economic hub in Surrey, a county with no cities. 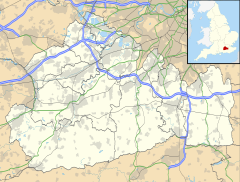 Although Guildford was historically regarded as the county town for Surrey, the council itself has its administrative base in Kingston upon Thames which, although formerly in Surrey, is now in Greater London. Public sector organisations of note that have headquarters in Guildford include Surrey Police, the South East England Development Agency and the Government Office for the South East. Politically, the constituency of Guildford is thought of as a traditional Conservative seat. However, for the first time in over ninety years, the 2001 general election returned a Liberal Democrat Member of Parliament, Sue Doughty. The 2003 Borough Elections returned a majority council for the Conservative party, replacing the Liberal Democrat-controlled council. In the 2005 general election Guildford returned a Conservative Party MP, Anne Milton – by a narrow margin (0.7% of the voting electorate, or 347 votes) and despite a 0.5% rise in the Liberal Democrat vote. The Conservatives also held the council majority in the local elections of 2007. Since then, Anne Milton has won over half the vote in the 2010, 2015, and 2017 general elections. Guildford is a thriving commercial town with the 2011 Financial Times annual list of Top 500 Global Companies listing five major businesses with a significant presence in the town – the list includes Philips Electronics, Ericsson, Colgate-Palmolive, Allianz and Sanofi. Media Molecule (acquired by Sony Computer Entertainment in 2010), Lionhead Studios (acquired by Microsoft Game Studios in 2006, closure announced on 7 March 2016), Hello Games, Criterion Games (acquired by Electronic Arts in 2004), Ghost Games UK (founded in 2013 by Electronic Arts), and Bullfrog Productions (acquired by Electronic Arts in 1995, closed in 2001) have helped the town become a centre for video game production. The bus chassis factory of the Alexander Dennis (established as Dennis Specialist Vehicles) and fire engine bodywork factory John Dennis Coachbuilders are also in the town as well as military vehicle builders Automotive Technik. The Surrey Research Park contains a number of world leading companies including satellite manufacturers Surrey Satellite Technology Ltd and BOC, part of The Linde Group the largest provider of industrial, medical and specialist gases in the UK and Ireland. Bellfields is a suburb in the north of Guildford lying adjacent to Slyfield Industrial Estate and Stoughton. The area includes private estates as well as current and former social housing estates. Christ's College, Guildford's senior school and Pond Meadow special needs school are in Bellfields. The neighbourhood includes St Peter's Shared Church. Guildford Children's Centre is here and has many pupils. This former village is now a major suburb of Guildford. Charlotteville is the area south-east of the town. It is loosely bound between Shalford Road and Sydenham Road, and encompasses the beauty spot of Pewley Down. A number of public footpaths lead from the town through Charlotteville to the downs and towards St Martha's Hill and Albury. It houses great many cottages and a few large, mostly privately owned properties and has the town's main cycling club founded in 1903. Guildford's mayor was its first president. The estate was funded by a wealthy doctor, Thomas Sells, laid out by the Guildford architect Henry Peak in 1862, and named after Sells's wife, Charlotte. Uniquely the Union Workhouse Casual Ward has been converted into a remarkable community centre and is a hub of activity day and night, home to the Montessori School, the centre for all manner of activities; physical, artistic, musical and creative. The adjacent St Luke’s surgery and Boots the Chemist provides Medical care, thus all generations seemingly catered for. The Heritage Centre historically known as the Spike has been restored in part to retell the fate of the vagrant and indeed, the casuals, many of whom had a large part to play in the building of this Town. A strong sense of belonging exists in Charlotteville and just 150 years after the village was founded it continues to flourish as a community. The official designation of the heart of Charlotteville as a conservation area means that Peak’s work may survive. The development introduced institutions such as the Cork Club, a cycling club Charlotteville Cycling Club and the charity Charlotteville Jubilee Trust, formed at the time of the Golden Jubilee. Two modern schools have been established in the village. The last of the shops closed in 2006. 1930 hailed the end of the Poor Laws and Guildford Union Workhouse, next to Cooper Road (named after Samuel Cooper (surgeon)) was renamed Warren Road Hospital and played a vital role in the World War II war effort. It received victims of the London air raids as well as Dunkirk and D-Day casualties. The Spike, a vagrants and casuals ward, continued as an overnight shelter for the homeless until 1963. With the arrival of the Welfare State the hospital changed its name again, this time to St Luke's Hospital and was soon a leading Cancer and Nurses Teaching Hospital. Coyle Community Hall was built and shared with the Charlotteville community. The 1990s saw St Luke’s Hospital moving to the newly built Royal Surrey County Hospital leaving the site to Crest Homes and within days Charlotteville once again found itself without a community centre. Due to be demolished in 2003 and replaced by a new Community Centre the Spike Casual Ward was given a Grade II listing and has been converted into a community and Heritage Centre open to the public. The Spike retains the only stone breaking cells that can be viewed by the public in the country. These small residential neighbourhoods are immediately south of and generally below Cathedral Hill also known as Stag Hill. Both neighbourhoods are close to Guildford railway station to the southeast and become without division Onslow Village to the south. As the University occupies the top and north of Stag Hill, it is a popular location for student lodgings. Onslow Village is the sloped suburb on the western outskirts of Guildford. It, with one outlying road continuation, forms a wedge between the A3 road and A31 roads south of the junction of the A3 and Egerton Road, Guildford's Cathedral Turn and directly below Henley Fort, an 1880s built London Defence Position and a Scheduled Monument. The area consists of a number of residential streets many of which are characterised by beech hedges. Parts of Onslow Village have been designated as conservation areas, enforcing a number of planning restrictions that are intended to protect the character and identity of the locality. Local amenities include the 5th Guildford Scout Group, a community news website, a Tennis Club and Onslow Arboretum. It also has its own football team, Onslow FC, established in 1986. There is a small village centre, with a parade of shops and a village hall. Onslow has one infant school, Onslow Infant School, as well as Queen Eleanor's School, a primary school. The local Anglican church is All Saints. The Village also has a Residents' association, the Onslow Village Residents' Association (OVRA) which was set up in 1956 and whose object is to "safeguard the amenities of Onslow village and to promote the welfare, interests and well-being of the residents". The Onslow Village Society was formed with the aim to tackle the acute shortage of decent working class housing following the First World War. Onslow Village Ltd acquired 646 acres (261 hectares) or just over a square mile of land from Richard Onslow, 5th Earl of Onslow in 1920 for approximately one quarter of its market value at the time. The aim was to create a "Garden City" to be modelled on the ideas of Ebenezer Howard's Garden City Movement. It was their intention to build a self-contained community with smallholdings, public buildings, open spaces, recreation grounds, woodland and a railway station, as well as developing sites for churches, hotels and factories. On Saturday 1 May 1920, ten weeks after the formation of the Society, the foundations of the first two houses were laid and by March 1922 ninety-one houses had been built. Unfortunately due to a lack of funding the scheme never reached full completion, with about 600 houses actually being built. Original drawings however showed that there were further plans to develop the farmland at Manor Farm, north of the A3. By the mid-1970s, one third of the properties were still owned by Onslow Village Ltd. Then, in 1984, the company was wound up and many shareholders and tenants had the chance to buy their homes at affordable prices. Onslow Village never got its railway station, however it did eventually get its woodland: the Onslow arboretum, developed by Guildford Borough Council as a specialist collection of eighty tree species from around the world. The Onslow arboretum is positioned right next to the play area with its own park, a large field, several tennis courts, toilets and a scout hut. Park Barn Estate is home to King's College, a school for 11- to 18-year-olds. There are also a number of primary schools in the area of Park Barn, including Guildford Grove School, which has a specialist sign-supported rescue base on the site that supports pupils with profound hearing impairments. Football team, Park Barn FC, plays in League 4 of the Guildford and Woking Alliance League. Guildford City Boxing Club moved from Bellfields to Park Barn in 2014, on Cabell Road. Stoughton is a mainly residential suburb north of Guildford town centre. It is the location of the former Stoughton Barracks, which was redeveloped for housing in the 1990s and renamed Cardwell's Keep. In Stoughton is The Wooden Bridge pub where both the Rolling Stones and Eric Clapton performed concerts at the early stages of their respective careers. Another pub of historic note was The Royal Hotel in Worplesdon Road, which hosted an early U2 concert and was owned by the former wrestler Mick McManus. This is now a Chinese restaurant. Stoughton has one junior school, Northmead Junior School. Is the small mixed land use area north of Guildford that is largely indeterminate from Bellfields, however to its east is Guildford's largest industrial and commercial park, Slyfield Industrial Estate. There was a cattle market held in the south of the industrial area until 2000 which moved to Maidstone, Kent. Slyfield has a community hall and a school. To the north of Slyfield is Stoke Hill, on top of which is a park, Stringer's Common, across which is the Jacobs Well neighbourhood which is part of Worplesdon civil parish. The central northern area of the town contains Stoke Park and the historic manor of Stoke at its centre, now the site of Guildford College. Within Stoke is the Guildford Spectrum leisure and sports centre. To the south of this mostly residential neighbourhood is London Road railway station, On Stoke Road there is a listed hotel, The Stoke. Adjacent to the Park Barn Estate, the Westborough Estate was built in the 1920s due to the growing population at the start of the 20th century. Westborough is home to a United Reformed Church and to a Community Primary School on Southway. The town has two railway stations. The main station (served by South Western Railway and Great Western Railway) is on the west side of the River Wey, across the river from the main shopping area and the bus station. It is on the Portsmouth Direct Line between London Waterloo and Portsmouth Harbour. There are also direct lines to Aldershot; Reading; Gatwick Airport via Dorking and Redhill; and alternative London routes via Cobham & Stoke d'Abernon and Epsom. There is currently one daily CrossCountry service to Newcastle, via Reading, Oxford, Birmingham, Derby, Sheffield, Doncaster and York. Guildford's other station, London Road, is about half a mile (1 km) north-east of the town centre, on the New Guildford Line. It is served by stopping services only between Guildford and Waterloo: there are four trains an hour each way (two on Sunday), two via Cobham & Stoke, and two via Epsom. These services are operated by South Western Railway. There is a proposal to build a new station on the Guildford to Reading line at Park Barn to serve the hospital and the Science Park, along with the University of Surrey's Manor Park campus. A few peak hour trains from both stations, operated by Southern, go to London Bridge via Sutton. Guildford lies at the eastern end of the A31 and is bisected by the A3, which links London and Portsmouth. The A25 connects Guildford with Wrotham Heath in Kent. The M25 is around 10 miles (16 km) to the north-east of the town. Bus services in Guildford are primarily operated by Arriva Guildford & West Surrey, with some additional services by Buses Excetera, Safeguard Coaches and Stagecoach South. Most routes are centred on the bus station, next to the Friary shopping centre. Many local bus services are circular routes (starting and ending at the bus station) with different numbers for the clockwise and anticlockwise services. There are also buses to many surrounding towns and villages such as Woking and Aldershot. As the main railway station is across the river from the bus station, only a small proportion of bus services stop at the railway station. To address this issue, the Guildford Shuttle was introduced in 2000. This was a free circular bus service linking various areas of the town centre. But it was withdrawn in August 2008 when the borough council withdrew funding for it. The operator of the service reintroduced it in January 2009 on a commercial basis, but withdrew it again in May 2010. There is also a park and ride service, with four main sites at Artington, Onslow, Merrow and the Spectrum. On 7 January 2018, Stagecoach introduced a fleet of nine battery powered buses to operate this service. National Express operate coach service 030 between London Victoria Coach Station and Portsmouth and Southsea via Egerton Road on the outskirts of Guildford, but not stopping in the town centre. Folding Brompton Bicycles are available for hire at Guildford station in the centre of town. The scheme was originally set up in partnership with South West Trains, then the principal train operator. Guildford council and the University of Surrey are co-operating on the launch of a community bike share scheme. Guildford has been the home of several writers, Edward Carpenter, the socialist poet and homosexuality equality activist, moved to the town after the First World War and lived there until his death in 1929. Bestselling author Albert Jack was born in Guildford and wrote Red Herrings and White Elephants (2004) at his home in Warwick's Bench. Other authors include Gerald Seymour, writer of Harry's Game and New York Times film critic Mordaunt Hall. Author and humourist P. G. Wodehouse was born prematurely in Guildford in 1881 while his mother was visiting the town. Novelist Kazuo Ishiguro was a resident. The Stranglers were based in the town in the early 1970s and were briefly known as "The Guildford Stranglers". Drummer Jet Black ran an off-licence in the town and bass player Jean-Jacques Burnel attended the Royal Grammar School. Progressive rock musicians Mike Rutherford, of Genesis, and Andrew Latimer, of the band Camel, were born in Guildford, as was jazz saxophonist Iain Ballamy. In the early 21st century music, drum and bass producers Cause 4 Concern and Sub Focus are from the town. Singer and actress Yvonne Arnaud lived in Guildford for many years, and the Yvonne Arnaud Theatre was named in her honour; later the town was the home of comic director, writer and actor Mackenzie Taylor (1978–2010). Cathy Newman was born in Guildford. Actors Stuart Wilson, Christopher Gaze, Barry Evans and Bonnie Langford are from the town, and Monty Python member Terry Jones attended the Royal Grammar School. Guildford has been home to racing driver Katherine Legge and sprinter Allan Wells, gold medallist in the 100 metres at the 1980 Olympics. Footballer Matt Jarvis grew up in Guildford, and the town is also home to Olympic kayakers Rachel Cawthorn and Liam Heath. Robert Hayward, the former UK № 4 Thai Boxer, is a resident. Cartoonist Piers Baker, who created Ollie and Quentin; the model Jodie Kidd, and news journalist Cathy Newman were all born in the town. Holly Samos – radio researcher and presenter lives here. Many of mathematician, logician and cryptographer, Alan Turing's earliest years were in this town where his family lived; Michael Buerk, BBC newsreader; Roger Fry, the English artist, critic and member of the Bloomsbury Group, lived in the house (Durbins) he designed and built in the town from 1909 to 1919; Alfred Smith, recipient of the Victoria Cross, was born in Guildford, as was WWE wrestler Paul Burchill. Julie Dawn Cole played Veruca Salt in Willy Wonka & The Chocolate Factory. Comedian Holly Walsh was born in Guildford. In Sir Thomas Malory's 1470 version of the Arthurian romances, Le Morte d'Arthur, Guildford is identified with Astolat of Arthurian renown; however only rural Celtic Bronze Age pieces have been found in the town. Continuing the Arthurian connection, there is a local public house, the Astolat. Guildford has been associated with the 1863 novel Alice's Adventures in Wonderland because of its importance in the life of its author, Lewis Carroll. There are several reminders of this connection throughout the town. Guildford Museum has a collection of items belonging to Carroll, see above. In addition to this, sculptor Jean Argent created two full-size bronze sculptures of Alice passing through the Looking-Glass and Alice and the White Rabbit, which can be found in the Castle Grounds and by the River Wey at Millmead respectively. In The Hitchhiker's Guide to the Galaxy by Douglas Adams, the character Ford Prefect, actually an alien from Betelgeuse, claims to be an out-of-work actor from Guildford. Crime at Guildford, a novel by Freeman Wills Crofts from 1935, is set in the town. Guildford has been captured on film in Carry On Sergeant, which was filmed at the former Queens Barracks, and The Omen, a scene from which was filmed at Guildford Cathedral. Singer-songwriter Robyn Hitchcock has sung about the town in "No, I Don't Remember Guildford", a song from his 1999 album Jewels for Sophia. The University Hall on the campus of the University of Surrey was the site of the first ever Led Zeppelin gig on 25 October 1968. ^ This eastern section of the Harrow Way is also known as the Pilgrims' Way, and in deeds, Via regia, and in the Pipe Roll 4 Ric. I m. 8 d of 1192–3 as Strata regia de Geldedone this being the west hill, Guildown whereas the east hill, where Guildford Castle is, was Pewsey Down. ^ Geldefort, Geldesfort, Gildeforda, Gildeforde (12th century); Geldeford, Guldeford (13th and 14th centuries); Gylford and Guldeford (15th and 16th centuries); Guildeford, Gildford, Gilford, and Gillford (16th and 18th centuries). ^ Olausson, Lena; Sangster, Catherine (2006). Oxford BBC guide to pronunciation. Oxford, England: Oxford University Press. p. 160. ^ "Grid Reference Finder". www.gridreferencefinder.com. ^ "Guildford · Population". population.city. ^ "Saxon Guildford". guildford.gov.uk. Archived from the original on 24 February 2008. Retrieved 28 March 2008. ^ a b "Guildford Borough Council : History of Guildford Castle". Archived from the original on 5 August 2011. Retrieved 24 December 2011. ^ "The Good Move Guide : Guildford History". Archived from the original on 12 January 2012. Retrieved 24 December 2011. ^ "A Brief History of Guildford". Retrieved 24 December 2011.
early evidence is such as Bronze Age and Roman farming and settlement at Christ's College School, Guildford 40 pages, Spoilheap Publications, Woking ISBN 0955884667 radiocarbon dated finds. By Archaeology South-East, Surrey County Unit, Rebecca Lambert, Phil Jones, Nick Marples, L. Allott and D. Young, 2012. ^ Powell-Smith, Anna. "Guildford - Domesday Book". domesdaymap.co.uk. ^ "Guildford Borough Council Website: Castle". ^ "www.castleexplorer.co.uk". Archived from the original on 17 June 2007. ^ Sharman Kadish, Jewish Architectural Heritage in England, English Heritage, 2006, p. 69. ^ a b "History of Guildford Jews". Guildford Jewish Community. Archived from the original on 29 September 2007. Retrieved 24 December 2008. ^ "Parliamentary Constituencies in the unreformed House". Retrieved 24 December 2011. ^ "Guildford Borough Council : The Wool Trade". Archived from the original on 25 January 2012. Retrieved 24 December 2011. ^ Altham, H. S. (1962). A History of Cricket, Volume 1 (to 1914). George Allen & Unwin. ^ Chilworth Gunpowder Works Surrey (Archaeological investigation report series), Wayne D Cocroft, 2003, English Heritage, London. ^ "National Rail Enquiries - Official source for UK train times and timetables". www.nationalrail.co.uk. ^ Morgan, Gavin (1992). The Guildford Guy Riots. Northside Books. ISBN 978-0-9520205-0-9. ^ "icons.org.uk The Guildford Guy Riots". Archived from the original on 27 September 2007. ^ "Guildford Union Workhouse - The Spike - Historic Site in Guildford, Guildford - Visit Surrey". www.visitsurrey.com. ^ "History & Business". Wincanton Plc. Retrieved 26 April 2008. ^ a b "The Foxenden Quarry Air Raid Shelter". In and around Guildford. Retrieved 17 May 2008. ^ "Foxenden Quarry Shelter, Guildford". Subterranean Exploration. Retrieved 17 May 2008. ^ "Foxenden Quarry,Guildford". Subterranea Britanica. Retrieved 29 August 2018. ^ Melaugh, Dr Martin. "CAIN: Northern Ireland Conflict, Politics, & Society. Information on 'the troubles'". cain.ulst.ac.uk. ^ "BBC News: 19 October 1989". 19 October 1989. Retrieved 12 February 2007. ^ "Guildford Borough Council Website-Tourist Information Centre". Archived from the original on 11 January 2007. Retrieved 13 February 2007. ^ "Guided Walks of Guildford - Walking Tour in Guildford, Guildford - Visit Surrey". www.visitsurrey.com. ^ "A History of The Angel Posting House". Archived from the original on 28 September 2007. Retrieved 13 February 2007. ^ "Channel 4 "The Best and the Worst Places to Live In Britain"". Retrieved 8 February 2007. ^ "Guildford – Best and Worst Places to Live – Channel 4". Retrieved 6 November 2007. ^ "PRNewswire: Top of the Shops – Gerald Eve Publishes Prime Retail". 5 November 2004. Retrieved 16 April 2007. ^ "Gerald Eve Prime Retail Flyer". Archived from the original on 23 June 2008. Retrieved 16 April 2007. ^ "River Wey and Godalming Navigations and Dapdune Wharf". National Trust. ^ "Dapdune Wharf - Heritage / Visitor Centre in Guildford, Guildford - Visit Surrey". www.visitsurrey.com. ^ "The Undercroft - Historic Site in Guildford, Guildford - Visit Surrey". www.visitsurrey.com. ^ [gwydir.demon.co.uk] "They were the administrative centre for local government, the market town, and the largest town in the county. However, local government has been reorganised more than once, and today the county towns are not necessarily the adminstrative (sic) centre of the county"
^ "county town - Definition of county town in English by Oxford Dictionaries". Oxford Dictionaries - English. ^ [play.google.com] Collection of Statutes Connected with the General Administration of the Law: Arranged According to the Order of Subjects, with Notes, Volume 8 page 344 "The Names of Towns limited for the safe Custody of Weights and Measures according to the King's Standard for the Shires following, as particularly appeareth ... Surr. The Town of Guilford"
^ "Medieval Guildford—"Henry III confirmed Guildford's status as the county town of Surrey in 1257"". Guildford Borough Council. Archived from the original on 1 November 2013. Retrieved 30 October 2013. ^ "2003 temperature". UKMO. Archived from the original on 28 February 2011. ^ "Der Spiegel (German): Der 8 Megapixel-Filmpalast". Retrieved 12 June 2007. ^ "New £19.5m civic centre approved". BBC News. 14 July 2006. Retrieved 20 August 2008. ^ "Your New Venue". G Live. 20 May 2011. Retrieved 20 May 2011. ^ "Never a dull moment with Estelle, article in Get Surrey". ^ "Guildford Philharmonic Orchestra". Archived from the original on 8 September 2012. ^ "Guildford Philharmonic loses council funding". BBC News. 9 November 2012. ^ James Watkins. "Farewell concert for Guildford Philharmonic Orchestra". ^ "Stoke Park - Municipal Park in Guildford, Guildford - Visit Surrey". www.visitsurrey.com. ^ "COG Press Release 6 February 2007 "Ambient Picnic moves to Epsom"". Archived from the original on 29 September 2007. Retrieved 13 February 2007. ^ "Ambient Picnic Official Website". Retrieved 13 February 2007. ^ "Astolat Model Railway Club Website". Retrieved 7 June 2014. ^ Church of Holy Trinity Historic England. "Details from listed building database (1029258)". National Heritage List for England. Retrieved 29 October 2012. ^ St Mary Historic England. "Details from listed building database (1377918)". National Heritage List for England. Retrieved 29 October 2012. ^ St John the Evangelist Historic England. "Details from listed building database (1294008)". National Heritage List for England. Retrieved 29 October 2012. ^ St Nicholas Historic England. "Details from listed building database (1029291)". National Heritage List for England. Retrieved 29 October 2012. ^ "Deaneries in Arundel & Brighton Roman Catholic Diocese". ^ "Latest News From The Monks of St. Augustine's". St Augustine's Abbey. 23 December 2010. Retrieved 6 April 2016. ^ "Welcome to Chilworth Benedictine Monastery". St Augustine's Abbey. 1 March 2016. Retrieved 6 April 2016. ^ "Archived copy". Archived from the original on 9 October 2015. Retrieved 9 October 2015. CS1 maint: Archived copy as title (link) "The Minister Provincial, Fr Michael Copps, in his monthly letter dated 9 March 2011 related to the Brothers of the Province the quiet ending of Franciscan life at what had been since 1890 the heart of our Province as its Novitiate House until recent years." ^ Champion, Neil. "Stoughton Methodist Church". www.gsmc.org.uk. ^ a b "Guildford Churches website". ^ "Website of Guildford Synagogue". ^ "Derby City Council Bulletin 4 July 2005 "highest score of 87% which was given to Guildford Spectrum"". Archived from the original on 27 September 2007. Retrieved 13 February 2007. ^ "National Pool Safety Awards". Archived from the original on 29 September 2007. Retrieved 13 February 2007. ^ "Guildford Spectrum Website- Swimming". Retrieved 13 February 2007. ^ "Guildford Spectrum Website- Tenpin Bowling". Retrieved 13 February 2007. ^ "Guildford Spectrum Website- Children's Parties". Retrieved 13 February 2007. ^ "Guildford Spectrum Website- Ice Skating". Retrieved 13 February 2007. ^ "Guildford Flames Official Website". Retrieved 13 February 2007. ^ "Welcome :: Guildford International Volleyball Club". www.guildfordvolleyball.org.uk. ^ Hodges, Lucy (12 June 2008). "Which is the best university for sport?". The Independent. London. Retrieved 27 February 2009. ^ "Guildford Hockey Club". Retrieved 16 March 2013. ^ "Surrey Spartans Hockey Club". Archived from the original on 6 December 2013. Retrieved 16 April 2013. ^ "Guildford City boxing coach Edwards gets GB call". Retrieved 26 January 2016. ^ "Guildford City Boxing Club History". Retrieved 26 January 2016. ^ "Guildford Rowing Club Home - Guildford Rowing Club". www.guildfordrowingclub.org.uk. ^ "Royal Grammar School of Guildford | About us". Royal Grammar School of Guildford. Retrieved 9 January 2018. ^ "A Brief History 1960's". The College of Law. Retrieved 20 March 2008. ^ "Surrey County Council Website: County Hall". Archived from the original on 20 March 2007. Retrieved 12 February 2007. ^ "BBC News- Election 2007– Local Council Elections- Guildford Council". 4 May 2007. Retrieved 4 May 2007. ^ "About the Surrey Research Park". Archived from the original on 22 December 2011. Retrieved 24 December 2011. ^ Henley Fort Historic England. "Details from listed building database (1019286)". National Heritage List for England. Retrieved 29 October 2012. ^ "5th Guldford Scout Group". 5th Guldford Scout Group. Retrieved 6 August 2018. ^ "Welcome to the unofficial Onslow Village community website". Welcome to the unofficial Onslow Village community website. Archived from the original on 15 April 2012. Retrieved 6 August 2018. ^ "Onslow Village Lawn Tennis Club". Club Spark. Retrieved 6 August 2018. ^ "Onslow Arboretum". Guildford Borough. Archived from the original on 29 March 2010. Retrieved 6 August 2018. ^ "Onslow Village Residents' Association (OVRA) - Home". www.surreycommunity.info. ^ "Streetmap.co.uk Map of the area". Retrieved 17 March 2007. ^ Gillard, Derek. "King's Manor School: an experiment in privatisation?". www.educationengland.org.uk. ^ "Homepage - Park Barn United FC". www.clubwebsite.co.uk. ^ "Guildford City Boxing Club's new home". 20 August 2014. Retrieved 26 January 2016. ^ Rose, David (2016). Guildford Pubs. Amberley. p. 52. ISBN 978-1-4456-5719-6. ^ The Stoke Hotel Historic England. "Details from listed building database (1029231)". National Heritage List for England. Retrieved 29 October 2012. ^ "POLICY A59: New rail station at Guildford West (Park Barn)". Guildford Borough. Retrieved 1 April 2019. ^ "Guildford Park and Ride". Stagecoach. Retrieved 8 January 2019. ^ "London – Portsmouth/Southsea – National Express 030" (PDF). Surrey County Council. 5 March 2007. Archived from the original (PDF) on 4 March 2009. Retrieved 12 January 2009. ^ "Green light for infrastructure improvements and community bike scheme". Guildford Borough Council. Retrieved 9 August 2018. ^ "Gerald Seymour at Books at Transworld". Archived from the original on 27 February 2007. Retrieved 6 March 2007. ^ "Today in Literature-P.G.Wodehouse". Retrieved 7 March 2007. ^ Patterson, CHristina (4 March 2005). "Kazuo Ishiguro: The samurai of suburbia". The Independent. London. Retrieved 27 March 2011. ^ "Stranglers website: History". Archived from the original on 29 January 2011. Retrieved 15 February 2007. ^ "CollectorsPost Website: Yvonne Arnaud Biography". Archived from the original on 10 April 2004. Retrieved 15 February 2007. ^ "Comic Mackenzie Taylor takes his life". Chortle. 20 November 2010. Retrieved 10 November 2010. ^ "Internet Movie Database- Stuart Wilson". Retrieved 15 February 2007. ^ "Obituary: Barry Evans". The Independent. 13 February 1997. Retrieved 5 March 2018. ^ "Daily Record". 11 February 2006. Retrieved 15 February 2007. ^ "Royal Grammar School website- Terry Jones". Archived from the original on 13 October 2006. Retrieved 15 February 2007. ^ ChampCar driver: "Motoring.co.za: Woman driver set to test for Minardi". Retrieved 7 March 2007. ^ Philip, Robert (19 January 2004). "Wells driven on by anger". The Telegraph. Retrieved 12 July 2016. ^ Fifield, Dominic (21 March 2011). "Matt Jarvis's work ethic draws praise from all quarters". The Guardian. Retrieved 12 July 2016. ^ "Liam Heath". British Canoeing. Retrieved 12 July 2016. ^ admin. "Guildford Muay Thai Fighter Rob Hayward to fight at Wembley Arena - This is Our Town Guildford". www.thisisourtown.co.uk. ^ "Newman, Cathy, (born 14 July 1974), presenter, Channel 4 News, since 2011 | WHO'S WHO & WHO WAS WHO". doi:10.1093/ww/9780199540884.001.0001/ww-9780199540884-e-249479. ^ "Famous Mathematicians of Guildford". Archived from the original on 6 February 2007. Retrieved 6 March 2007. ^ "BBC Correspondents". BBC News. 3 January 2003. Retrieved 3 June 2007. ^ "beerintheevening.com Website: Astolat, Pub". Retrieved 15 February 2007. ^ "Guildford and Alice in Wonderland". ^ Stubbings, David (24 September 2014). "Surrey's novels with Sherlock Holmes, Oliver Twist & Ford Prefect". ^ "Ledzepplin.com : Concert Timeline". Retrieved 24 December 2011. ^ "Guildford Borough Council Meeting Minutes 7 October 2004 "As part of the 25th anniversary of the twinning with Freiburg, the Mayor had recently hosted a very successful visit by a delegation from Freiburg."" (PDF). Archived from the original (PDF) on 28 June 2007. Retrieved 12 February 2007. ^ "Guildford-Mukono Link Website". Retrieved 12 February 2007. Wikimedia Commons has media related to Guildford. Look up Guildford in Wiktionary, the free dictionary. Wikivoyage has a travel guide for Guildford.